Healthy Fit Goddess: Is "paleo" actually vegetarian? A couple of years ago, I started thinking about food as fuel for my body rather than just something I ate to feel full. Since then, I've read several books and hundreds of online articles and blogs about nutrition from all kinds of "experts" ranging from doctors to dieticians to athletes. My first conclusion was to eat a completely vegan diet. 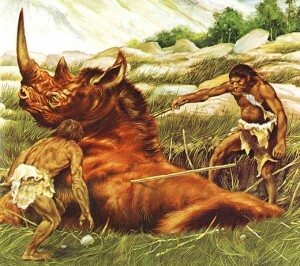 I later started CrossFit, which advocates the Paleo Diet. This means eating as our ancestors did, mostly vegetables and meat (lots of it). So, I started eating small amounts of fish and eggs again, but still no meat, and still mostly plant-based. Paleo and a healthy vegan diet are actually somewhat similar in that they eliminate dairy and processed foods...things that humans are not meant to eat. Therefore, I've made the absolute conclusion that to fuel our bodies most efficiently, we have to eat foods at their most natural states. However, I'm still torn on exactly how much animal protein is best for our bodies. I came across this very interesting and well thought-out article: Was ancient man a vegetarian? One thing that I've never believed about the popular Paleo diet is the assumption that early humans were able to obtain meat for every single meal every day. It seem unlikely that they were able to catch prey every day. Even the primitive tribes still ongoing today do not catch prey every day. They go on trips for days at a time to catch something and then bring it home for a feast. This article makes a similar point that early humans did eat animals, but only occasionally, and they mostly ate gathered vegetables, fruits, and nuts. While many parts of humans are different from our primate ancestors, our digestive systems are essentially the same and remarkably similar to those of chimpanzees and orangutans. Our digestive system is designed to be able to digest vegetables, fruits, and meat. However, our current diet is much different from that of chimps. 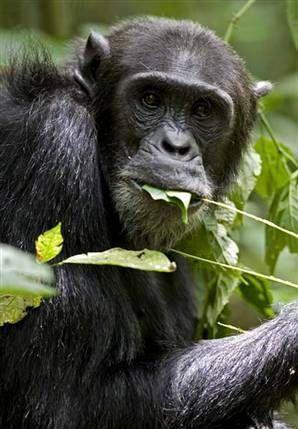 Most monkeys (including chimps) eat fruits, nuts, leaves, insects, and sometimes birds or lizards. Therefore, it is unbelievable to me that early man changed their diets so drastically to eat mostly meat. As humans got more and more advanced, it was easier to catch or cultivate animals, so we started eating more of them, but our digestive systems have not evolved for us to be full-on carnivores. Humans are indeed omnivores, we have evolved to eat both plants and animals. However, I think that the true Paleo diet is to eat much more plant-based than animal-based. And our obsession with eating meat for every meal (among other things) may have led us to the detrimental state of our health (see The China Study or Forks Over Knives). Therefore, I'm sticking with my mostly plant-based diet with the occasional animal treat. What do you think? Start a discussion in the comments below! Thanks for this post, I came across it when I was searching for paleo-vegetarians. I'm a vegan but am thinking of adding in small amounts of local eggs and fish to my diet like you did (and eventually join crossfit). I'm vegan for the ethical reasons, but I've decided I don't mind taking eggs from happy hens on a local farm or friend with pet chickens, and I would be comfortable with fishing (and have done so in the past- but with no luck ever catching any!) plus I live in a coastal town so local fish are easy to come by. I agree with you- I don't think humans are meant to eat lots of meat since it would be so difficult to catch back in the caveman days. I think we are omnivores, we can eat just about anything in a pinch, but the bulk of our food should be the easy to get stuff- fruit, vegetables, nuts, ect. Stealing an egg from a chicken and catching fish were likely much easier than spearing a wild boar. Thanks for your comment, I'm glad to know that there are other people out there that think Paleo should be more vegetarian. Everyone in my CrossFit gym is so obsessed with meat and I feel somewhat pressured to eat it to build muscle.